Bruce Nall reported that a large print of his photograph March of Unknowns was juried into the Arvada Center's exhibition, "Art & Conflict." This exhibition opened September 14, 2017 and the artwork will be on display through November 12. The Arvada Center is located at 6901 Wadsworth Blvd. Stefan Begej would like to report two sales, a full-size and a half-size photographic reproduction of his mixed-media wall sculpture titled Exuberance No. 9 (saxophone). These pieces along with a viola, trumpet, and flute have been on exhibit at the Dazzle Jazz Club in Denver since August, and have been part of Stefan’s attempt to offer versions of his artwork in a different media at more attractive and accessible price points. The Gallery is located in Arapahoe Community College, 5900 S. Santa Fe. Drive, Littleton. The exhibit ran July 17 - August 4. 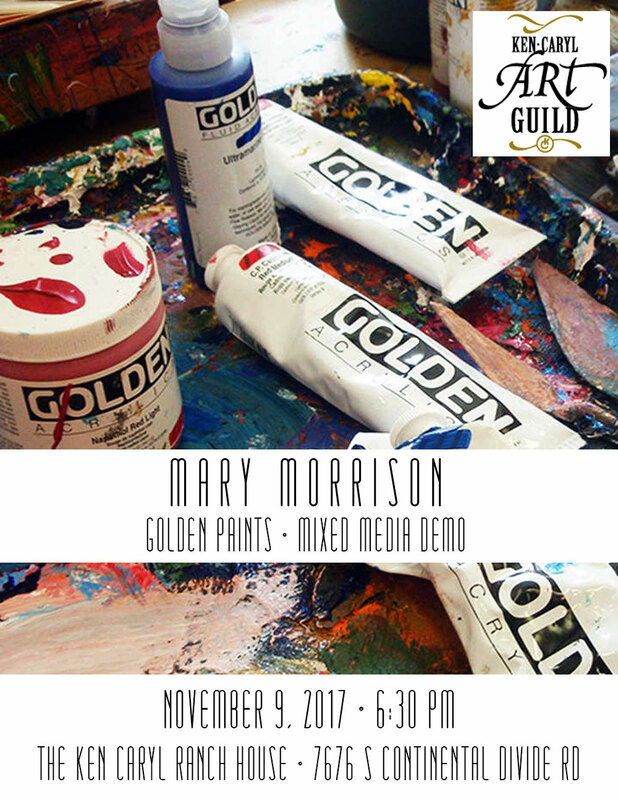 For the program we had Mary Morrison of Golden Paints. It was an interesting and informative presentation of the latest Golden Paint products. You can visit Golden Paints website at www.goldenpaints.com. Exuberance No. 19 (viola) by Stefan Begej has been accepted into the "Paradox" show at Spark Gallery, 900 Santa Fe Drive, Denver. The opening reception is Friday, August 18, from 6 - 9 pm, with the show running until September 10th. 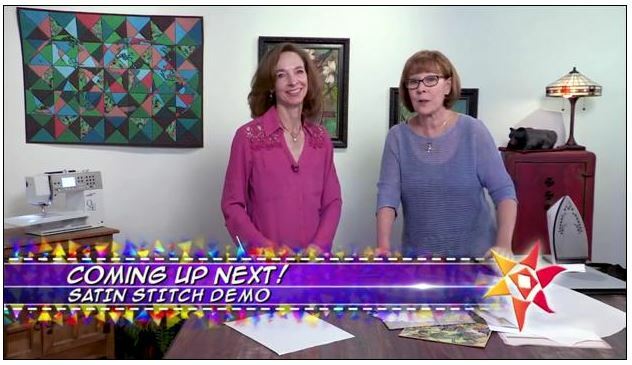 Susie Hellman’s watercolor Red Flag Warning has been invited to the “Arts 34th All Colorado Show” at the Curtis Center, 2349 East Orchard Road, Greenwood Village. The show will run from October 14 – December 23, 2017. October 2017 Meeting of the Guild! There was a meeting of the Guild on Thursday October 12 at the Ken Caryl Ranch House, 7676 Continental Divide Road. There was a short business meeting from 6:30 till 7:00 to discuss plans for upcoming meetings and events. For the program we had a “show and tell” session. Members brought recent works or something they were working on to describe to the group and get useful feedback from fellow artists. This has proved popular and interesting in the past, and was enjoyable by all again! Stefan Begej’s mixed-media artwork “Camille’s Purse” received an Award for Excellence at the 40 West Gallery show titled “Contemporary Still Life”. The gallery is at 1560 Teller Street, Lakewood, and the exhibit ran from July 5 to 29. September 2017 Meeting of the Guild! There wass a meeting of the Guild Thursday September 14, 2017 at the Ken Caryl Ranch House, 7676 Continental Divide Road, at 7PM featuring photographer Terry Mieger. Terry is an accomplished photographer and had an interesting program. Doors opened at 6:30, and members arrived early to socialize with fellow art enthusiasts. KCAG Plein Aire and Potluck Breakfast Event! On Saturday, August 12, at the South Valley Open Space Park there was a KCAG gathering for a potluck breakfast and plein aire event. Pavilions, scenic trails, red rock outcrops, Mann Reservoir, flowers, and critters surround the area for scenic artistry. The Art Guild provided plates, tableware, cups, coffee, bagels and breakfast burritos. Stefan Begej has 3 pieces accepted into the Contemporary Still Life show at 40 West Gallery (1560 Teller Street, Lakewood). It runs from July 5 - 29, with an opening reception during the Arts District First Friday event on July 7 from 5-8pm. The three pieces are "Camille's Purse - The Great Stillness after Bursting", "To Infinity, but not Beyond - Forever Cold, Forever Still", and "Exuberance No. 12 - Standing Waves". Susie Hellman has been invited to show her watercolor "Erosion" at the International Watermedia 2017 exhibition at the Cottonwood Center for the Arts in Colorado Springs (427 East Colorado Ave). The show runs June 2 to June 24, with an awards reception on June 21. Cindy Marshall donated two small mixed media pieces to a charity event at the Vintage Theatre on behalf of the Gathering Place. One of the pieces sold, titled "November 8, 2016". The exhibit will be up for a while. Dazzle Jazz Club just moved to 15th & Curtis in Denver, and has invited Stefan Begej to show some of his photographic reproductions of musical artworks during the opening month of June. The framed full-size and half-size reproductions include "Exuberance No. 2" (trumpet), "Exuberance No. 9" (saxophone), "Exuberance No. 19" (flute), and "Exuberance No. 21" (white viola). Michele Sires-DeLorean will be participating in the juried exhibition “Predictions and Perceptions 2017” hosted by Tri-Lakes Center for the Arts, March 28 - June 2, Opening Reception April 7, 6-8 pm. Three pieces were selected. Susan Hellman sold a watercolor painting "Arizona Canyon" hanging at the Tubac Arts Center for an upcoming Open Studio Tour. Gail Firmin's mixed media artwork "Floral Notes" was selected to show at the upcoming 40 West Gallery exhibit "The Five Senses" from April 5-29. Gail is currently exhibiting four photos including "The Delight of the Tulips" at the Deep Space Gallery in Parker, through April 5. She will also have artwork showing at Pure Colorado, from March through June. Bruce Nall's photograph "Iron Pinwheel" was selected to show at the upcoming 40 West Gallery exhibit "The Five Senses" from April 5-29. Stefan Begej was the third KCAG member to get into the "Five Senses" show at 40 West Gallery. Four works were selected - "Exuberance No. 9" (sax), "Exuberance No. 16 " (baseball bat and ball which won an Award of Excellence), "Exuberance No. 19" (flute), and "Exuberance No. 21" (viola). These artworks are full size, high resolution photographic reproductions of his mixed-media wall sculpture originals. 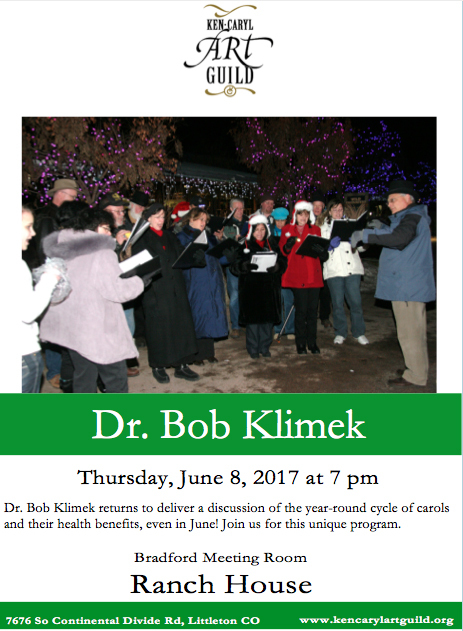 Our returning speaker for our June meeting was Dr. Bob Klimek from the Colorado School of Mines music department. He spoke about the year round cycle of carols and their health benefits. 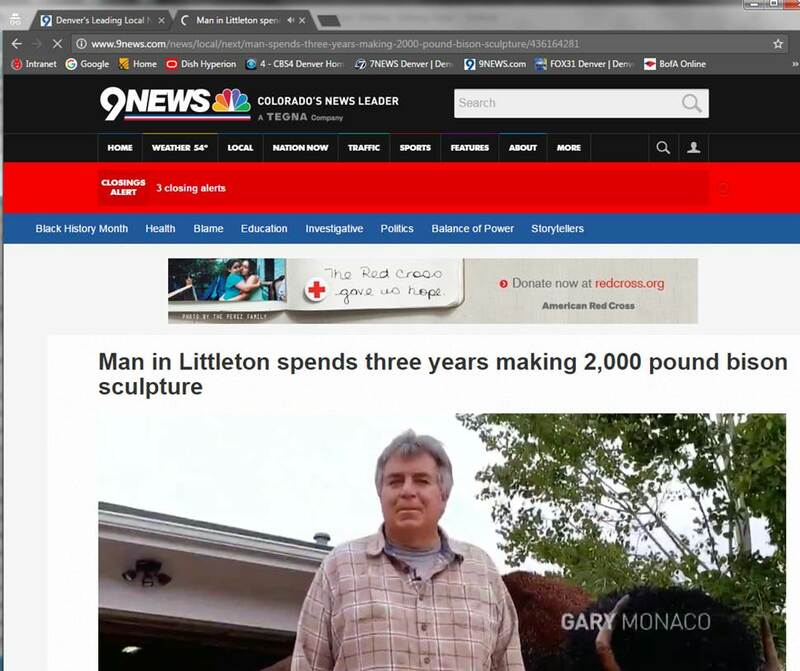 Channel 9 news “next” had two pieces on Gary Monaco and his buffalo statue he told us about in his presentation last year. 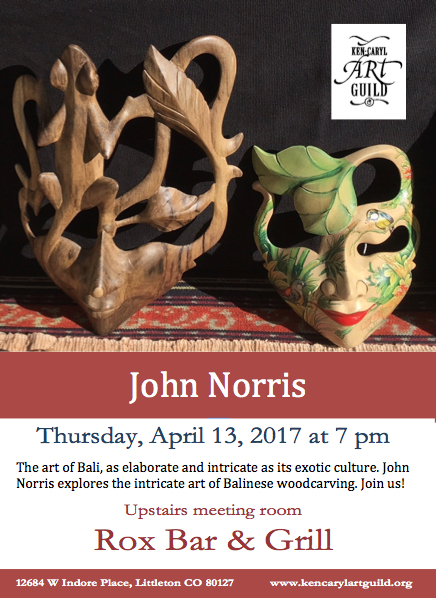 Woodcarver, John Norris, took us to the world of Bali. He explores the art of woodcarving in their elaborate, intricate, and exotic culture. Bruce Nall's sculpture, "Walk The Talk" will be included in the 2017 FAC Member Exhibition at the Foothills Art Center at 809 15th St in Golden. The Preview Reception is 2/2 from 6 to 8 pm and the art will be on display in Gallery A through 4/23. The Tubac Center for the Arts has selected two of Stefan Begej's book cover artworks "Encyclopedia of Gold" and Flute Mechanics" for their seven week Book Cover Exhibition, 2/24 through 4/16, 2017. 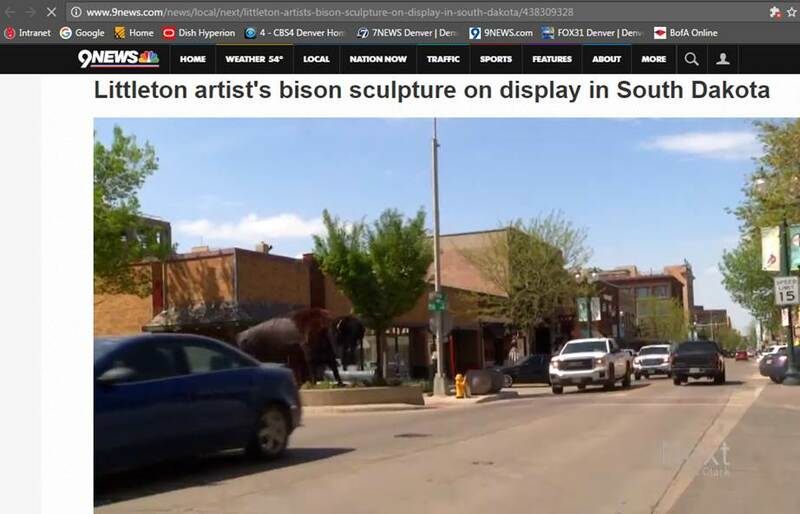 Additionally, the artwork will be included in the two day Tucson Festival of the Book, "... one of the largest book and arts related festivals in the US...," during the weekend of 3/11-12. 1) Juror Randy Brown selected two of Bruce's photographs, "Iron Flare" and Iron Cupola Bird" for exhibition in the Littleton Fine Arts Board's "Eye of the Camera 2017." The exhibit dates are from 2/17 through 3/26, 2017 at The Littleton Museum on Gallup Street. 2) The jury committee for the Tri-Lakes Center for the Arts in Palmer Lake selected two photographs, "Iron Flare" and "Trolley 25 Celebrates" for the "Visions of Light Photography Show". The opening reception is 3/3 from 6 to 8 PM and the exhibition runs from 3/3 to 3/24. 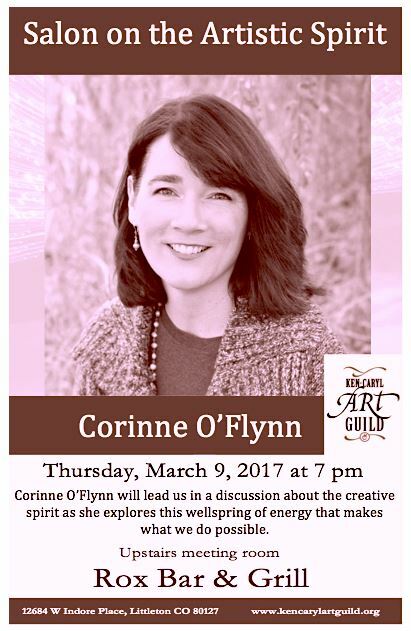 Author, Corinne O'Flynn, guided members through an exploration of creativity discussing questions such as what makes us creative, what is this wellspring of energy that makes us do what we do, and how do we handle criticism. Adams State University in Alamosa purchased a print of Stefan Begej's piece titled "Exuberance No. 16" (baseball bat and ball) for their newly renovated East Campus Building housing the Department of Human Performance& Physical Education. Steve Begej's "Exuberance No. 19" (flute) was accepted into the Littleton Museum Own an Original show received a Third Place award. Candy Vallado entered the 2016 Denver Audubon International Nature Photography Contest, and won Second Place. Suzie Hellman, a new KCAG member as of July had her watercolor “Agate” accepted into the Tubac Center of the Arts Arizona Aqueous XXXI exhibit which opens January 20, 2017. 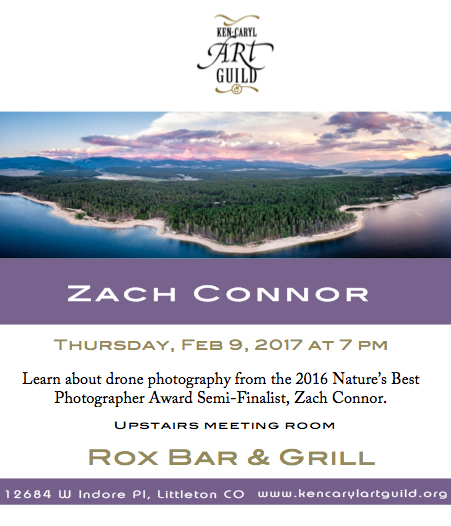 2016 Nature’s Best Photographer Semi Finalist, Zack Connor of ZRC Photography presented an informative program on the technical requirements of operating a drone to take breathtaking aerial photos. We had a great start to the New Year with Chaz Kemp as our January speaker. 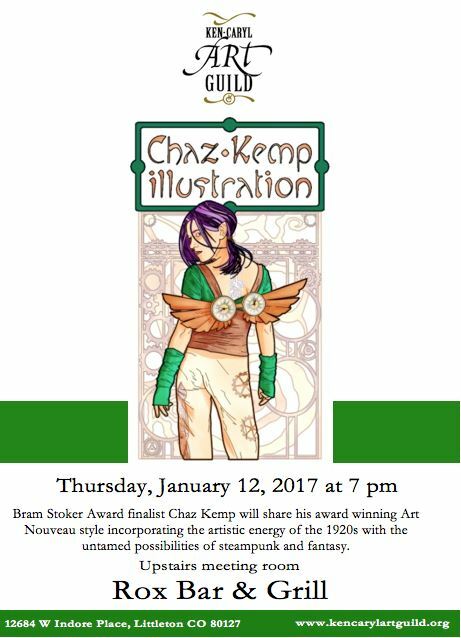 Chaz is an illustrator, musician, and actor. He shared his life journey through these artistic disciplines with the common thread being that he likes to dream. Interlaced through his talk were some very inspiring quotes from myriad well known personalities. He currently uses Corel Draw to create his unique art nouveau marries steampunk style illustrations. Congratulations to our KCAG president Steve McCall for completion and installation of his full-sized bronze sculpture of an eagle titled "Guardian of Freedom". 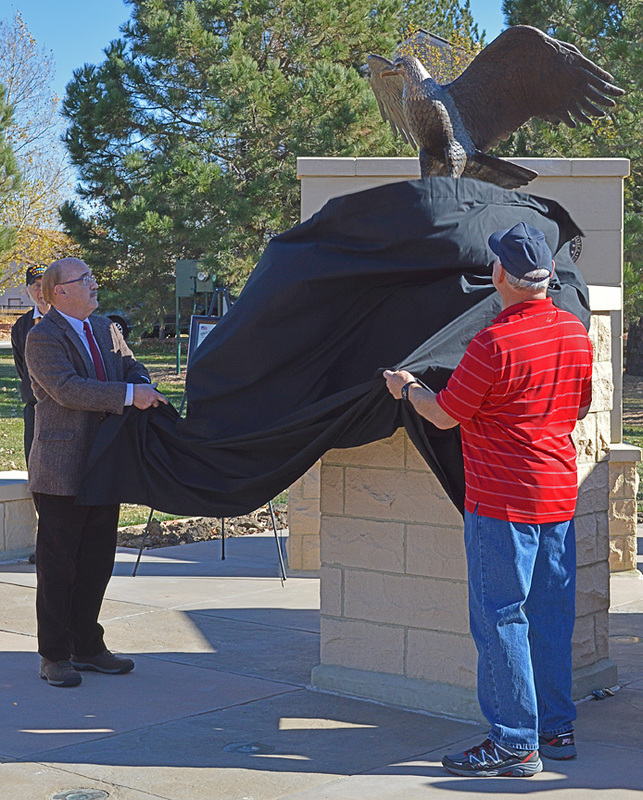 The eagle will be unveiled and dedicated at a celebration of Veterans Day at the Ken Caryl Veterans Memorial on Saturday, November 12, at 11am. This has been a huge project for Steve with lots of nail-biting, but the results are well worth the effort. The eagle is an excellent example local art organizations promoting art in their community. Congratulations to the following KCAG members who were accepted into the "Attracted to Abstracts" exhibition at 40 West Arts Gallery which ran from Nov 30 - Dec 24, 2016. The opening reception was Dec 2 from 6 - 8pm.